Located on the left bank of the River Dnipro in a picturesque park area of Kiev, the Hotel Bratislava has a lovely view of the famous green Dnipro slopes. From the hotel you can easily reach the city center in 15 minutes as the Darnitsa subway station is nearby; the Borispil International Airport and central railway station are 30 minutes by taxi. The Bratislava Hotel, built in 1980 and reconstructed in 1998. There are 364 rooms (866 beds). 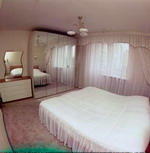 Each room has bathroom with shower, telephone, TV. The hotel has restaurants, bars, cafe and parking lot. Paper copier facility, conference hall, news-stand, beauty parlour and barber shop, drug store are also available. The interior is decorated in traditional Slavic style.